See also ways to avoid the taisha. 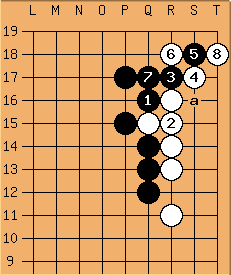 A joseki for White for avoiding the taisha is to play through . However, the jump to is a mistake and should have been played solidly at a (and if Black pushes again, then White can jump). The question posed is how Black should suitably punish White for this mistake. If you'd like to think about it before seeing the answer, please do that now. If you feel clueless, here's a clue. Black starts playing atari on the stone. Care to go back and try to read some follow-up moves before looking at the answer ? 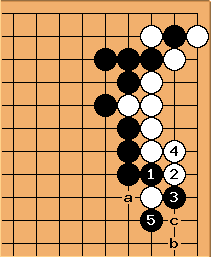 According to the book, Black should play atari with , then hane, and if White counter-hanes, Black plays nidan-bane, giving way once if White plays atari with . Suppose White protects with (White should just play nice-doggie at a instead of , painful as it is). Black is about to push through and cut. Care to think about which side Black will cut on, the "inside" or "outside"? ... Black pushes through and cuts on the "outside" with and White protects with . Finally, Black captures the outside white stone in a ladder with . The above discussion implies that the ladder is good for Black. If it were White's ladder instead, would White's original jump to still be wrong in Diagram 1? 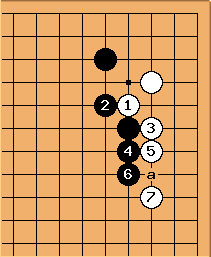 If is still wrong, and the ladder is good for White, is still correct in Diagram 3? If not, how should Black alter the moves to take account of the ladder? Cf. cut the side you don't want. Too late. Black has already played taisha.